Yacht builder Damen has announced that the build of its SeaXplorer 77 yacht project is advancing well with the keel laid at a ceremony at the yard's Galati facility attended by the owner on July 27. Earlier this year Damen announced it was preparing to ramp up production on its SeaXplorer series of explorer yachts by reallocating much of the yard space that was previously used for building military vessels – called Vlissingen East – to the series. This yard space will also be used to build Damen Yacht Support vessels, such as the 55 metre project Power Play, which began sea trials earlier this month. The SeaXplorer 77 has been commissioned by a client who wants to use it as a surfing, diving and heliskiing platform. 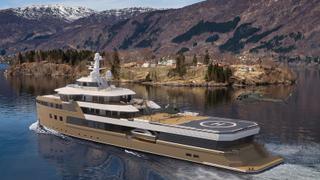 This 2,700GT yacht is due to launch in late 2020 as a follow-up to the SeaXplorer 65, also in build, which is scheduled for fitting out at the end of 2018. Rose Damen, commercial director of yachting at Damen and Amels, shared that the SeaXplorer 77 places a strong emphasis on helicopter operations, designed around a pair of customised Airbus ACH125s. 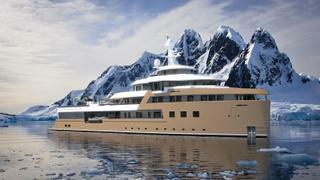 Key features will include a dedicated ski room with avalanche safety equipment and enough storage space for snowmobiles, Jet Skis and a 10.5 metre tender, while the reinforced ice classed hull, compliant with the new IMO Polar Code, will allow the SeaXplorer 77 to operate safely in high latitude regions. Dedicated aircraft fuel tanks, storage for helicopter spares and pilot accommodation will add to its globetrotting credentials. 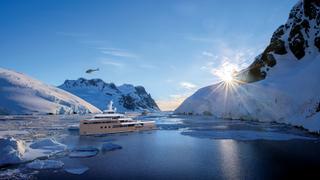 A true explorer yacht, the SeaXplorer 77 will have a maximum autonomy of 40 days. 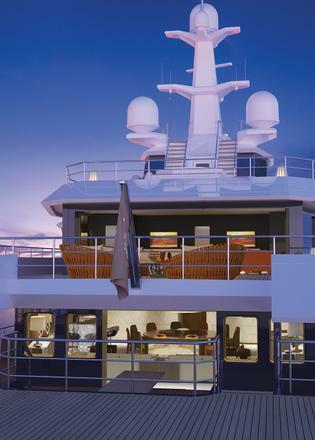 Accommodation is for up to 12 guests and 25 members of staff, including, guides and pilots as well as the yacht's operational crew. 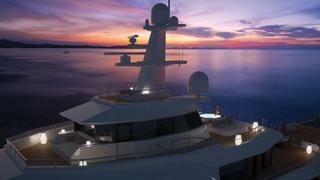 Additional details are being kept under wraps for now, but it is understood that Azure Naval Architects contributed to the naval architecture, and the yacht will have an estimated cruising speed of 14.5 knots.